The HM-459 Asphalt Pavement Analyzer (APA) by Pavement Technology is a three-wheel, multi-function Asphalt Wheel Tracker for accurate evaluation of rutting, fatigue cracking and moisture susceptibility of hot and cold asphalt mixes. This versatile model complies with AASHTO methods T 234 Hamburg Test (with solid wheels) and AASHTO T 340 APA Rut Test (with concave wheels). The environmentally controlled chamber can test samples in dry or submerged conditions and the exclusive high pressure feature generates 250psi or more for advanced testing of mix designs for airport runways and taxiways. The unique drive system allows simultaneous testing of multiple samples at different speeds and load rates. Three rectangular slab or beam specimens or six cylindrical specimens can be tested at the same time using Gyratory, Marshall, or vibratory beam samples molded in the laboratory or field cores cut from existing pavement. In a single pass, five or more measurements can be collected on a beam specimen and three or more on a cylindrical specimen. This extremely accurate system calculates the data to 0.00001mm. A built-in Chiller for Low Temperature Fatigue Testing on Beam Specimens is included. Optional equipment for studded wheel and fatigue testing at temperatures to -5°C includes Cold Plate, Molds, Studded Wheels and Software. 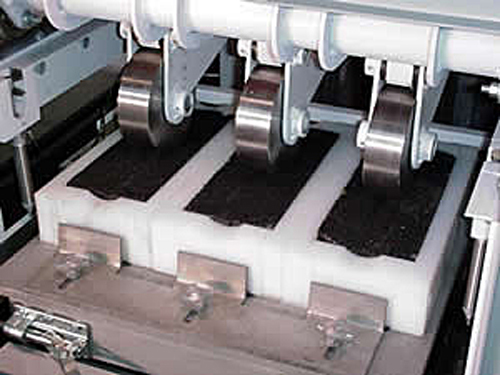 Optional equipment to perform Microsurfacing/Slurry Seal Testing includes Molds, Rubber Wheels and Software. A PLC-based system with new Gen 5 Software controls operation and collects data on a PC where measurements are plotted and displayed in graphical/numerical format. The drive system operates the wheel tracking assembly from 0 to 60 cycles (120 passes) per minute. Both speed and stroke are adjustable for Hamburg Testing. Wheel loading is applied with controlled contact pressure on beam or cylindrical samples for rutting, fatigue and moisture damage testing. Independent pneumatic cylinders generate adjustable loads to each of the three wheels applying contact pressure on the specimens. It’s easy to prepare and begin operation with a sliding tray to load and position the samples, and toggle clamps that secure it against the frame. The sample holding assembly quickly locates the sample molds properly under the loading wheels for testing. Heating strips and a cooling unit with a microprocessor-based controller regulate the temperature of the main chamber from 5° to 80°C ±1.5°C (41° to 176°F). The 30gal reservoir can be raised with a pneumatic cylinder and flooded to a constant water level over the top of the test specimen for submerged testing. A weir valve allows water to drain back to the 35gal stainless steel storage tank where water temperature is maintained from ambient to 80°C (176°F). Sample Pre-Conditioning Shelves are located in the base of the APA to bring three beam or six cylindrical specimens up to desired test temperature. The Asphalt Pavement Analyzer comes fully equipped to run many loaded wheel tests. Concave wheels to perform rut and moisture testing, solid wheels for fatigue and Hamburg testing are all included in sets of three each. Four sets of High Density Polyethylene Molds for rut, moisture, fatigue and Hamburg testing are included, each as a set of three. Three 3/4in (19mm) high-pressure rubber hoses are used in conjunction with Concave Wheels for the AASHTO T 340 Rut Test and with the high pressure loading feature for airport runway and taxiway design. A source of clean, dry compressed air at 120psi (8.3bar) and 8CFM (226LPM) is required.